The KonMari method of tidying has sweeped our nation. I for one, read both books and then started to binge watch the show in an effort to purge my closets and our house of unnecessary clutter. As I started taking the clothes out of my drawers and kitchen supplies from cabinets, I started to think about using these concepts to declutter our finances and get out of debt. Marie Kondo’s methods are simple, effective, and suggest that if we complete this process once, we’ll be able to live a life free of clutter and full of joy. 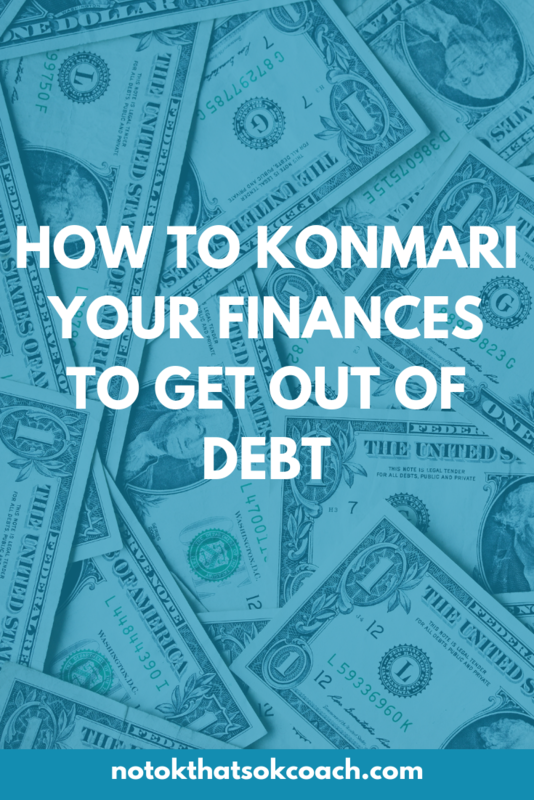 Let’s go over her concepts from a financial lens to get you one step closer to getting out of debt. Would you live in another location now that you have a little more money to spend? Would you start saving for a large purchase (car or home)? How would it feel not to pay your loans every month? Now, you have to commit to it. Without a firm commitment and picture of your ideal life, it will be easy to fall off the wagon and go back to your old ways. We might want to get out of debt but skipping this step will make it harder to stay the course. Before you start, you have to see what you’re working with. Marie Kondo takes a tour with the guests on her show for them to pull back the curtain of the clutter in their home. Now is the time for you to do this with your finances and pull your free credit report to find out where you stand. This will give you, your credit score as well as reveal the debts you have among other things. Once you see this, you can get started on your journey with a clear commitment, visualization, and starting off point for saving money and getting out of debt. When you’re tidying up your house, Kondo suggests that you do similar things at the same time. This means pulling out all of your clothes in one location, kitchen supplies, medicine, etc. We’re going to do the same thing with your finances. The key is to start with the category that is least emotional and end with the one that will take you some more time to process. This would be a personal choice but be honest with yourself as you’ll have a higher success rate using this method. I’ll be the first to admit that I love subscription boxes and Amazon’s subscribe and save. Whether it comes quarterly, once a month or twice a year; having something conveniently come to my door with little to no effort on my part is helpful. But these boxes and convenience fees add up. And if I’m being completely honest, I’ve forgotten that I had something scheduled for delivery and had to pay to either return it or kept it in the closet never to be used again. This is money that I could be using towards bills. But instead, it was being used on items that I didn’t need. Go to your Amazon account, your subscription box orders, and any other website where you’ve set something to be automatically billed to you. Maybe you have an eBook or audio book subscription, get beauty boxes, or have treats sent to your dog. Whatever it is, declutter it. Do they bring you enough joy that you’re willing to sacrifice pushing back getting out of debt? Really think about if that lip gloss is going to make you happier than not paying your student loans anymore. Now, that you’ve stopped some, if not all subscriptions, look at the items in your house that you either overordered or never used and sell them to earn some extra cash. In college, one of the ways my organizations raised money was by getting students to sign up for credit cards. We set up booths in the student lounge area and walked door to door to get as many signatures as we possibly could. Fortunately, this is no longer happening on college campuses, but there are still so many other places to sign up for a card for some free swag. It’s so easy to get sucked down the rabbit hole and have too many cards. Pull out all of your credit cards and find out how much you owe on each of them. Then start streamlining them. For the ones that you don’t use and have no balance, maybe it’s time you get rid of them. For the ones that have a balance that you’re trying to pay off, create a spreadsheet or use an app to show what you owe from the highest amount to the lowest. This will help you visualize your debt. Then look through each of your credit cards to find out what you’re actually spending your money on. Some companies already split purchases into categories, which can you help you with this process. If yours doesn’t, come up with your own categories (bills, clothes, social, professional). Once you have the amounts you owe, and the categories, it’s time to make some tough decisions. You might have bought clothes or shoes recently that still have the tags on them, now is the time to pull them out, hold them and ask yourself if they bring you more joy than paying off your debt. If you’ve been spending a lot of money on coffee before work or drinks with friends, it’s time to declutter these extraneous expenses. You’re likely to have a lot of monthly bills, some of which are the debt you’re trying to pay off. Either print out or pull up all of your bills for the last six months with the contact information for each company. You might have a streaming service, phone, water, internet, insurance, and electric bill. From your bills, identify which ones you need to survive, and which ones would be nice but are not necessary. Then ask yourself if Netflix brings you more joy than getting out of debt and not having to pay back your student loans anymore. Then, get all of the numbers together and give these companies a call to see if you’re getting the best rates and discounts available. Maybe you’re a AAA member, or there’s a lower data plan they just launched. You never know unless you ask. Going through the decluttering process is hard, especially when you’ve never done it before. It’s important to get support to make sure you understand where you are and where you need to go. The professionals at Lexington Law are here to help and can provide you with personalized assistance to repair your credit. Their blog also provides a wealth of information that can be helpful on your decluttering journey.